The Bulgarian chapter of Mars Society has localized and printed the topographic and albedo Maps of Mars. Mihail Mateev, President of Mars Society Bulgaria tells the story of the Bulgarian edition. „The history of this project is an illustration of the fact that the world is small. Or that modern technology it smaller and allow people from both ends of the globe to exchange information. 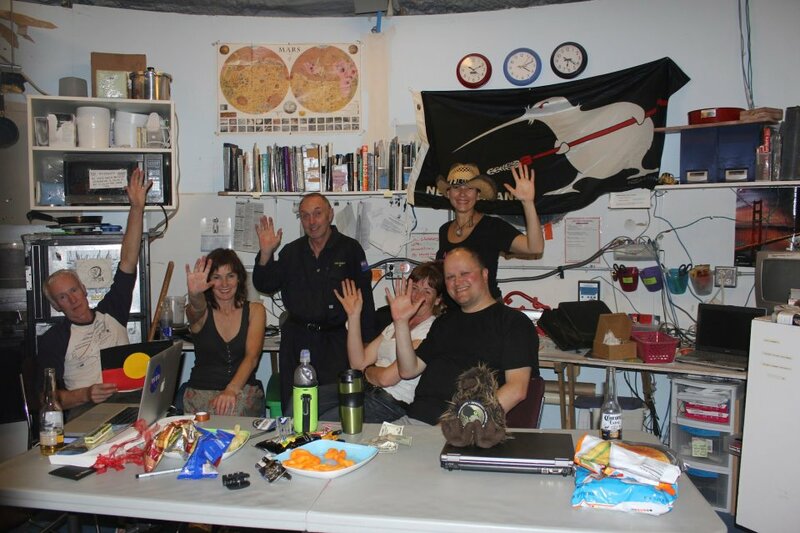 In 2011, I was looking for a map of Mars with the desire to buy one piece and hang it on the wall. Then visited a commercial website where I found that a map of Mars is available online, but the it could not be delivered. Then I found a post on Mars Society’s Facebook page, illustrated by a photo, by Dr. Jonathan Clarke (Director of Field Research with Mars Society Australia), that was made by the New Zealand “Kiwi team” (Crew 118) at Mars Society’s Mars Desert Research Station, with a clearly visible map of Mars, hanging on the wall of the habitate. Another MDRS veteran, Ákos Kereszturi of the Hungarian Astronomical Association connected me with Henrik Hargitai, editor of that map. 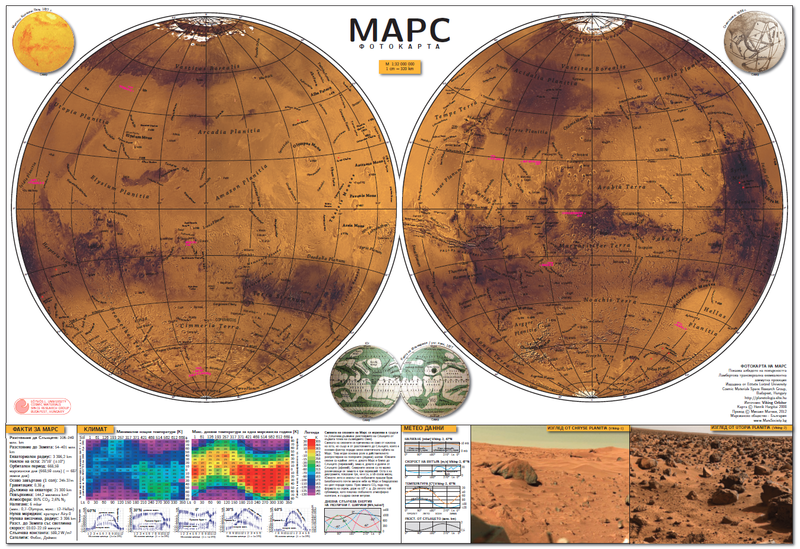 Subsequently we exchanged correspondence that ended up in 2 new planetary maps –a photomosaic and a topographic map of Mars – translated and published in Bulgarian by the end of August 2012. We published these maps as part of our objectives to promote the idea of colonization of Mars, and also to say “thank you” to all our current and future donors (who donate at least 10 lev). 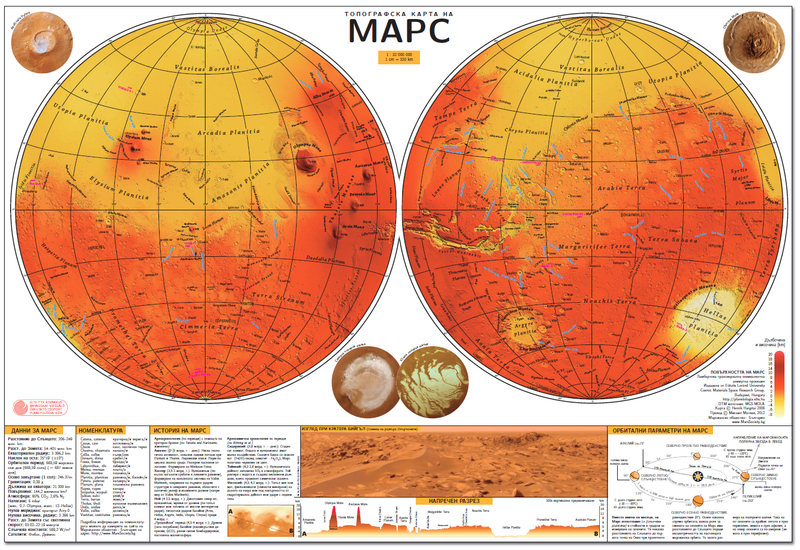 The maps are only sent to donors and members of the “Mars Society – Bulgaria” and are not available for sale. In connection with our focus for the public benefit of the maps, sets of the maps will be sent for free (except for postage fees) to all those libraries and astronomy clubs, planetariums and observatories that are interested in receiving them and connect with “Mars Society – Bulgaria”.